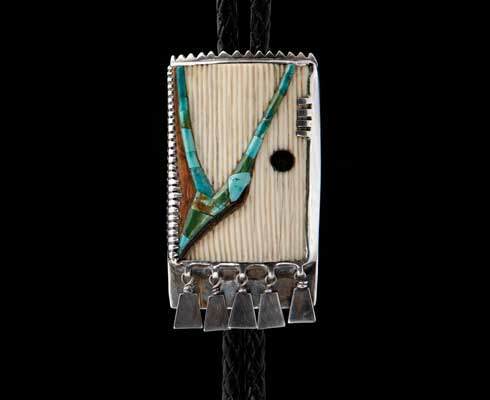 Above: Sabatie bolo slide made of sterling silver, fossilized ivory, turquoise, and ebony. A GUEST ARRIVES two weeks early, by accident, to a pueblo dance. 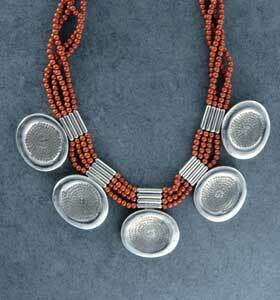 She’s embraced as the apprentice of Hopi’s modernist jewelry master, Charles Loloma, and stays four and a half years. After leaving Hopi country, she continues for the next 25 years to craft some of the most innovative jewelry of the 20th century, combining Hopi influences with her own North African heritage. On June 12, when the Wheelwright Museum of the American Indian opens Eveli: Energy and Significance, Eveli Sabatie’s jaw-dropping jewelry designs will flesh out the tale of the serendipitous meeting of two extremely creative people. BORN IN ALGERIA and raised in Morocco, Sabatie studied languages at the Sorbonne, but hardly spoke any English when she arrived in San Francisco in the sixties. Yet she found that her North African and Middle Eastern heritage styled her perfectly, at 28, for the zeitgeist of Haight Street. One day, while attending the San Francisco trial of a Native American draft resister, she met three Hopi men, who invited her to attend a bean dance. She accepted but misconstrued the date and wound up marooned in the Third Mesa village of Hotevilla, Arizona. With nothing better to do, she went to the local laundromat, where a man washing clothes alongside her introduced himself as Charles Loloma. Today hailed by many Native jewelers as the most influential innovator of his time, by the late sixties Loloma had gone from having his jewelry repeatedly rejected from juried art shows for not being “Indian enough” to having work commissioned by Lady Bird Johnson for state gifts to the queen of Denmark and Imelda Marcos. He combined turquoise and coral with rare woods like cocobolo and ebony, and stacked cut stone with cantilevered slices of ironwood into “height bracelets” that jutted up to one and a half inches tall. 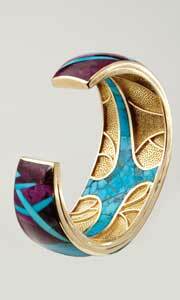 Blue Reeds and Purple Nights bracelet, 18-karat gold, turquoise, and sugilite. Sabatie, now 76, is one of only two people whom Loloma ever claimed as his student. Early on at Hopi, watching Loloma cut stones and tufa-cast metal in his one-room studio, she discovered that her learning was to be done “through watching, in silence.” To improve her technique at the jeweler’s bench, she went back to San Francisco for two months of formal education in soldering and jewelry fabrication, then returned to the village. The first object Sabatie remembers making that felt as if it expressed a voice of her own was a box of dried cow bone and silver. “I consider that my whole work came out of that,” she says. It got her started trying to identify an essence to materials that would dictate the form of her finished work. As she compared her own visual experiences in North Africa to the Native cultures she was now discovering, Sabatie recognized Navajo jewelry’s inverted half-moon naja, or squash blossom, as a relative of a Moorish design traded between Tuareg and Berber nomads. Sabatie’s education took her down paths that converged with Loloma’s own explorations. “Here was someone who could help him expand by bringing in elements he hadn’t thought of before,” Falkenstien-Doyle says. When Loloma came across a book about Egyptian inlay, he recognized the cross-cultural similarity: At Hopi, the first craftsmen of katsinas had inlaid cotton-wood squares with turquoise to make their earrings. Sabatie for her part became intrigued with metalworking techniques—heating, hammering, reheating. “I loved that struggle with the metal,” she says. Sabatie left Hopi in early 1974 and lived for five years in Santa Fe before moving to Tucson. Throughout the seventies and eighties she had shows at galleries in Santa Fe, Scottsdale, Philadelphia, and New York. Given that Sabatie produced around 300 works a year until her retirement from jewelry making in 1998, the 200-plus pieces in the retrospective paint but a small portrait of the radical career of Loloma’s onetime protégée. 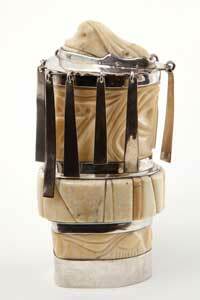 A 4 3⁄4” x 2 1⁄4” box made by Sabatie from sterling silver, bone, and ivory. PREVIEWING SABATIE’S work in museum trays reveals a remarkably expressive gamut of colors and form, from lustrous plugs of rock as jagged as molars to carved and polished stones nested deep into fabricated metal settings. The scale of the pieces is often queenly, yet try them on and their ergonomics make for outstanding fits. Knuckle rings hug finger joints. Boxes of bone and silver suggest ancient alchemical secrets. A tiny ring sprouts a cluster of quartz domes that shine like mosque roofs. A small book entitled The Significance is fabricated from both silver and gold, in a technique Sabatie first encountered as a girl in a French colonel’s collection of inlaid Arab daggers and scimitars. “It blew my mind,” she says. Falkenstien-Doyle expects the same to happen to exhibition visitors, who will see how that chance meeting in a laundromat unfolded into a visual encyclopedia of innovation in jewelry—Sabatie’s as well as spectacular samples of Loloma’s. “I certainly hope to drive home the idea that there are a lot of contributors to what we think of as Southwestern jewelry,” the curator says. Ellen Berkovitch is featured in “Storytellers”. 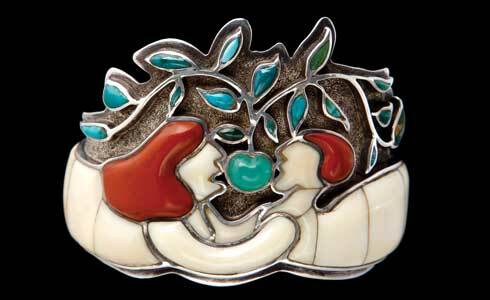 Orchards of Love bracelet, crafted by Sabatie of silver, fossilized ivory, red jasper, chrysoprase, and turquoise. Eveli: Energy and Significance runs June 12, 2016–January 15, 2017, at the Wheelwright Museum of the American Indian, on Museum Hill in Santa Fe. The show, Sabatie’s first retrospective, features more than 200 works created between 1969 and 1998. It also inaugurates the Wheelwright’s Schultz Gallery, a space for rotating exhibitions next door to the breathtaking permanent Southwestern jewelry collection in the Martha Hopkins Struever Gallery.